Given what is already known about the demographics of the various party voters, we can tell a lot about who supported the flag referendum just by looking at the correlations between voting for a given party and one of three other major variables. The first major variable is the turnout rate in the first flag referendum. The correlation between turnout rate in this first referendum and voting National was a very strong 0.86. That is enough by itself to suggest that the bulk of the people who did end up voting in it were National supporters. The correlation between turnout rate in 2014 and voting National was, however, 0.76, so we can see that the people who voted in the first flag referendum were mostly those who are generally inclined to vote whenever they can. This was also true for Conservative Party supporters, who had a correlation of 0.70 with turnout rate in the first flag referendum. Green, ACT and New Zealand First voters were only mildly interested. The correlation between turnout rate in the first flag referendum and voting Green was 0.07, with voting ACT it was -0.01 and with voting New Zealand First it was -0.21. None of these were significant. Labour Party voters were almost entirely indifferent to the whole idea. The correlation between voting Labour in 2014 and turnout rate in the first flag referendum was a very strong -0.84. This was something broadly shared by all of the Maori-heavy parties. The correlation between turnout rate in the first flag referendum and voting for both the Maori Party and Internet MANA was -0.67, and with voting for the Aotearoa Legalise Cannabis Party it was -0.55. Predictably, given these statistics, it was mostly Kiwis of European descent who were interested in the first referendum. The correlation between being of European descent and turnout rate in the first flag referendum was 0.85. The correlation between turnout rate in the first flag referendum and being either Maori or a Pacific Islander was -0.65, and with being Asian it was -0.27. Perhaps the most striking correlation of all is that between turnout rate in the first flag referendum and turnout rate in 2014 – this was an extremely strong 0.90. Those who like to vote tend to take every opportunity they can to actually do it. There was also a correlation of 0.89 between turnout rate in the first flag referendum and median age. The correlations between wealth and turnout rate were significant, but only marginally so. All of the income bands above $70K were significantly positively correlated with turnout rate in the first flag referendum, but only marginally so – the strongest of them was 0.31. None of the income bands below $70K had a significant positive correlation with turnout rate in the first flag referendum. By contrast, all of the income bands below $10K had a correlation of -0.50 or more strongly negative, the strongest of all being for those who had a negative income. The correlation between being in this income bracket and turnout rate in the first flag referendum was -0.84. Likewise, the correlations between education and turnout rate bordered on statistical significance. Although there were significant positive correlations between turnout rate in the first flag referendum and having either an Honours degree (0.25) or having a doctorate (0.27), this was true for neither a Bachelor’s nor a Master’s degree (both 0.13). Mirroring this, the correlation between turnout rate in the first flag referendum and having no academic qualifications was not especially strong, at -0.28. One of the strongest correlations of all was between turnout rate in the first flag referendum and living on freehold land: this was 0.87. All of this gives us a clear picture. The sort of person who turned out to vote in the first flag referendum was the same sort of person who is most heavily involved in running the country: rich, old, white and National voting with leisure time. The second major variable is the turnout rate in the second flag referendum. Here it is only really meaningful to speak of the differences in voting pattern to the first flag referendum. Although the second flag referendum was still mostly a vehicle for Kiwis of European descent (the correlation between the two demographics strengthened from 0.85 to 0.88), the people who turned out for it tended to be more Maori. The correlation between turnout rate in the second flag referendum and being Maori came in to -0.57 from -0.65. Against this, turnout rate for the second flag referendum faded among Pacific Islanders and Asians. This may have been because the further the process wound on, the more likely the least established Kiwis were to drop out of it. People who voted Green were also less likely to turn out in the second flag referendum. The correlation between the two fell to 0.02 from the 0.07 of the first flag referendum. This was probably because the correlation between being in the 20-29 age bracket and turnout rate fell from the -0.41 of the first flag referendum to the -0.50 of the second. All of this reflected the fact that the second flag referedum saw a considerably higher turnout rate among those who did not want to change the flag. The correlation with voting to change the flag fell from 0.86 for the first flag referendum to 0.80 for the second. The third major factor is the percentage of people who voted to change the flag. These people were almost all National voters. The correlation between voting National in 2014 and voting to change the flag in the second flag referendum was a whopping 0.95. This is an extremely strong correlation, and it tells us that basically the only people to even vote to change the flag were died-in-the-wool National voters. 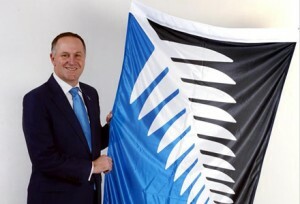 Maoris really didn’t want to change the flag – the correlation between the two was -0.77. These numbers suggest that there was a small core of Maoris who knew from the beginning of the process that they didn’t want to change the flag, but who waited until the second flag referendum to voice their disapproval. Asians were a curiosity, because they had a negative correlation with turnout rate in either referendum, but a slightly positive correlation of 0.11 with voting to change the flag. Some will find it very curious that the old were much more likely to vote for change than the young, which goes against the usual pattern of the old being more conservative. The correlation between being aged 65+ and voting to change the flag was a very strong 0.62, which is amazing if one considers that one of the arguments for keeping the flag in the first place was that old people had become accustomed to it over many years of living under it. For their part, the young preferred to keep the flag. The correlation between being in the 15-19 age bracket and voting to change the flag was -0.53. Some might find these latter points extremely interesting, because they support anecdotal evidence from overseas suggesting that the generation to follow the Millenials – those who some have dubbed Generation Z – are more conservative than their immediate predecessors. This question will be revisited in the second edition of this book, to be written after the 2017 General Election!